A couple who got married at the Belladrum Tartan Heart Music Festival have named their new-born daughter after the event. 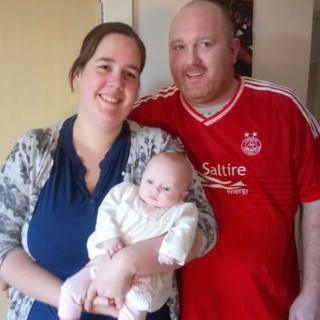 Baby Bella's mum and dad, Catriona and Gareth McIntosh, from Inverurie in Aberdeenshire, tied the knot at the festival near Beauly in 2014. Their wedding ceremony was held at the site's historic Belladrum Temple. Teacher Mrs McIntosh has attended the Highlands' biggest music festival since she was 13 years old. The couple said: "We have always loved the atmosphere of Belladrum and always spoke about how ace it would be to marry there. "Obviously we spoke about calling the baby Bella if she was a girl and both decided that it was very fitting given our tie and how we feel about the festival." Festival promoter Joe Gibbs: "Bella's whole raison d'etre is to be an all-ages event rooted deep in our community. Baby Bella is the most wonderful human embodiment of that ethos." The McIntoshes are planning to attend this summer's festival, which is widely known as Bella and taking place this year from 3-5 August. Glasgow rock band Franz Ferdinand have been confirmed as the Saturday night headliners, with Scots singer KT Tunstall as the band's support act. Seventies disco legends Sister Sledge are to headline on the Thursday night.